This article is about the city in Illinois. For other places, see Rockford. Rockford traces its roots to 1834, as the combined settlements of Midway were founded on both banks of the Rock River. On the west bank, Germanicus Kent and Thatcher Blake (with his slave Lewis Lemon) founded Kentville; the east bank was settled by Daniel Shaw Haight. With the location of the Rock River equidistant between Lake Michigan and the Mississippi River, the combined settlement derived the name "Midway". In 1836, Winnebago County was created (from both Jo Daviess and LaSalle counties), with Midway named as its county seat. In 1837, the village of Midway was renamed Rockford, highlighting a rocky river ford across the Rock River in the village. The same year, Rockford established its first post office (with Daniel Shaw Haight as the first postmaster). In 1840, the first weekly newspaper began circulation. In 1847, Rockford Female Seminary (today Rockford University) was founded. In 1852, Rockford was officially chartered as a city; a year later, the long-running "Forest City" nickname first appeared, used by the New York Tribune. Also in 1852, the Galena and Chicago Union Railroad connected Rockford to Chicago by railroad. At the time of its founding, many of the village's residents were transplants from the Northeastern United States and upstate New York. Descended from English Puritans, the Midway/Rockford population was similar to much of the rest of northern Illinois and nearly all of Wisconsin during the mid-19th century. After the Black Hawk War, additional immigrants moved to northern Illinois; during the 1830s and 1840s, Rockford and Winnebago County was considered a cultural extension of New England. During the antebellum period, Rockford shared abolitionist leanings, lending considerable support to the Free Soil Party and the later Republican Party. In 1848, 42 percent of voters in Winnebago County (where Rockford dominated as the county seat) voted for Martin Van Buren. In 1852, Free Soil candidate John P. Hale became the first presidential candidate to visit Rockford, although he would only receive 28 percent of the vote. In 1860, Abraham Lincoln won 3,985 votes in Winnebago County to the 817 votes of Stephen A. Douglas. The 1850s brought industry that would change Rockford forever. In 1853, inventor John Henry Manny moved to Rockford to produce horse-drawn mechanical reapers for farmers and transport the finished products by rail. Chicago implement manufacturer Cyrus McCormick (whose company became International Harvester) took Manny to court after he produced nearly 6,000 machines; Manny would prevail on both judgement and an appeal. Along with production of agricultural machines, Swedish furniture cooperatives established the city as a manufacturing base. The Rockford Union Furniture Company, under John Erlander, spearheaded these cooperatives. Today, Erlander's home is a Rockford museum that shows his efforts in elevating Rockford to second in furniture manufacturing in the nation, behind Grand Rapids. During the Civil War, one of the first Illinois regiments to be mobilized, the Zouaves, were from Rockford. The city also served as the site for Camp Fuller, a training site for four other infantry regiments. In 1884, Rockford established its first city-wide public school district, constructing Rockford Central High School in 1885; following the construction of the high school, the district began construction of brick multi-story multigrade school buildings across the city. The Rockford Female Seminary became the alma mater of Jane Addams in 1881. This move accompanied the Seminary's transition into a more complete curriculum, which was represented by its renaming to Rockford College in 1892. Culture flourished with the founding of the Mendelssohn Club in 1884, which became the oldest operating music club in the United States. This was complemented by the construction of a Carnegie library in 1902, which became the first building of Rockford's public library system. 1903 saw the dedication of the Winnebago County Veterans Memorial Hall in the presence of sitting President Theodore Roosevelt. Roosevelt returned to Rockford during his campaign in 1912 and again to address the soldiers at Camp Grant, a training site for World War I soldiers. John F. Kennedy campaigns through State Street in downtown Rockford in 1960. The twentieth century saw demographic changes to Rockford. An influx of Italians, Poles, Lithuanians, and African Americans replaced the previously dominant Irish and Swedes. The city was also no stranger to contemporary political issues. Electorally divided between wets and drys on the subject of prohibition, Rockford featured a coalition of labor unionists and socialists that elected numerous aldermen and carried 25 to 40 percent in mayoral elections. During World War I, an antiwar protest by the International Workers of the World led to 118 arrests. In 1920, the city was a target of the Palmer Raids. While its congressional district favored Republicans, Rockford continuously elected former Socialists as mayor between 1921 and 1955. One of its contemporary attractions, the Coronado Theatre, opened in 1927. Noted for its atmospheric styling, the Coronado rivaled its counterparts in Chicago and was added to the National Register of Historic Places in 1979. Camp Grant was turned over to the Illinois National Guard. During World War II, it reopened as an induction center and POW detention camp. The USS Rockford, a Tacoma-class frigate named for the city, was commissioned in March 1944 and earned two service stars. In the September 1949 issue of Life magazine, postwar Rockford was described as "nearly typical of the U.S. as any city can be." Due to this archetypal nature, sociologists like W. Lloyd Warner warned of the necessity to "understand the realities of their system." Heavily dependent on manufacturing and experiencing a shift in economic development toward its eastern borders, Rockford began to suffer irrevocable decline. Impetuses for this shift in economic development include the construction of the Northwest Tollway in 1958, the new campus for Rockford College in 1964, and the campus of Rock Valley College and the Chrysler Belvidere Assembly Plant in 1965 near the eastern periphery of the city rather than downtown. Efforts to revitalize the downtown were made in the 1970s with the construction of a pedestrian mall and a ten thousand-seat multipurpose arena. The former sectioned off Rockford's Main Street, impeding vehicle traffic, to the criticism of nearby business owners. The latter, the MetroCentre, opened in 1981 to performances by Dionne Warwick and The Rolling Stones. State grants were also consulted to reverse the trend, such as those that funded an Alexander Liberman sculpture placed at a downtown intersection in 1978. However, further decay occurred in the 1980s, such as the end of Amtrak service on the Black Hawk rail route from Chicago in 1981 and the closure of the Coronado Theatre due to declining revenues in 1984. Economic diversification has been difficult but ongoing for the area. The aerospace industry, represented by Woodward and Collins Aerospace, is dominant in Rockford. In 2012, Woodward selected suburban Loves Park for a $200 million manufacturing campus toward its energy control and optimization systems. Boeing included Rockford in a list of five finalists to manufacture the 777X during union disputes in 2014. The healthcare industry, represented by OSF Saint Anthony Medical Center and SwedishAmerican Hospital, is also involved. SwedishAmerican, in partnership with the University of Wisconsin Carbone Cancer Center, opened a $39 million Regional Cancer Center in 2013. Downtown improvements became more evident in the first decade. The Coronado Theatre reopened after an $18.5 million renovation in 2001. The controversial pedestrian mall was removed, returning Main Street to a two-lane thoroughfare complete with cafe-style seating and wind-powered streetlights. The MetroCentre underwent a $20 million renovation, prompting interest in the purchasing of its naming rights; the arena was subsequently renamed the BMO Harris Bank Center. An open-air amphitheatre and a riverwalk were constructed to tie the Discovery Center Museum and the Burpee Museum of National History together. Most significantly, the Stanley J. Roszkowski U.S. Courthouse was constructed for $100 million. Even before the Great Recession had an effect on Rockford, the city was affected by flooding of its Keith Creek in 2006 and 2007. Grants were won from FEMA to widen the creek and demolish over one hundred homes to stem the severity of future floods. Since the crisis set in, population has declined. Thirty two percent of the area's mortgages were underwater by 2013; Forbes rated Rockford number three on its America's Most Miserable Cities list in the same year. In the first four months of 2014, the unemployment rate of Rockford declined from 12.9 percent to 9.2 percent, but these figures remained well above the national average. The emphasis given to eastern areas in Rockford have rendered their western counterparts with blighted neighborhoods. In 2002, Rockford's public school system was court-ordered to spend $250 million on upgrades to western schools after it was found culpable for discrimination against residents served by them, many of whom were African American. Rockford has recently seen more of a diversification in its economy. Job gains have resulted in the lowest unemployment rate in Rockford since 2000. Most significantly, Mercy Health, the largest employer in nearby Janesville, WI[better source needed] decided in 2016 to build its largest facility in Rockford after a lengthy political debate. The massive $465 million complex is the most expensive construction project in Rockford history. The facility is expected to be completed by 2019.Also in 2016, ATI, ABX and Atlas Air partnered with Amazon Prime Air and began operating multiple daily cargo flights from the Rockford Airport. According to the 2010 census, Rockford has an area of 61.949 square miles (160.45 km2), of which 61.08 square miles (158.20 km2) (or 98.6%) is land and 0.869 square miles (2.25 km2) (or 1.4%) is water. Neighboring communities that border Rockford, and are considered an integral part of the Rockford metro area, are the cities of Loves Park, Machesney Park, Belvidere, and the villages of Winnebago, Roscoe, Rockton, Poplar Grove, New Milford, and Cherry Valley. Also of note, South Beloit, Illinois and Beloit, Wisconsin are part of this continuous urban area that stretches for approximately 30 miles along the Rock River from the Chicago Rockford International Airport north to the Southern Wisconsin Regional Airport. Rockford is approximately 85 miles west-northwest of Chicago, and 70 miles south-southeast of Madison. The Rock River forms the traditional center of Rockford and is its most recognizable natural feature. One of its largest tributaries, the Kishwaukee River, joins the Rock River at the southern end of the city near the Rockford airport. Since the 1946 closure of Camp Grant, much of the length of Kishwaukee has been redeveloped into parkland and forest preserves, effectively forming the southern border of the city. Other waterways that feed into the Rock River include Spring Creek (northeast region), Keith Creek (east region), and Kent Creek (west region). Of the 8 Illinois dams of the Rock River, the Fordham dam is located south of downtown. Due to its location in the Midwest, naturally a deciduous forest, Rockford's climate has four clearly defined seasons. Summers are usually hot with the average high temperature in July, the hottest month, being 84.5 °F (29.2 °C). The winter months can bring bitterly cold air masses from Canada. The average high temperature in January, the coldest month, is 29.5 °F (−1.4 °C). June is Rockford's wettest month while January is the driest. During a typical year, Rockford receives 36.2 inches (919.6 mm) of precipitation. Rockford and surrounding areas are prone to violent thunderstorms during March, April, May, and June. On April 21, 1967, a violent F4 tornado struck the neighboring town of Belvidere, killing twenty-four people and injuring hundreds more at Belvidere's High School. Other severe weather events, such as hail and strong winds are common in these storms. On July 5, 2003 at 04:13, supercells produced tornadoes causing widespread damage on both the east and west sides of Rockford. Approximately 70,000 people were without power, with many on the west side suffering in the heat without electricity for a week. It took months to clear the damage, but because the storm struck so early in the morning there were no injuries or fatalities. However, these sometimes violent storms bring the majority of summer rainfall. The city is also prone to severe snowstorms in winter, and blizzards are frequent winter occurrences. On January 13, 1979 over 9 inches (23 cm) of snow fell on Rockford in just a few hours during one of the strongest blizzards in the city's history. The city averages approximately 36 inches (91.4 cm) of snowfall in a normal winter, but greater amounts are common. The snowiest winter in the history of the city was the winter of 1978–1979, when 74.5 inches (189 cm) of snow fell. The record high temperature is 112 °F (44 °C), set on July 14, 1936 during the Dust Bowl, and the record low temperature is −31 °F (−35 °C), set on January 31, 2019. As of the 2010 census, there were 152,871 people and 66,700 households. Rockford is in the center of its namesake metropolitan area. The racial makeup of the city was 65.1% White (58.4% Non-Hispanic white), 20.5% African American, 0.4% Native American, 2.9% Asian, 0.01% Pacific Islander, 7.5% from other races, and 3.6% from two or more races. Hispanic or Latino of any race were 15.8% of the population. The median income for a household in the city was $55,667, and the median income for a family was $65,465. Males had a median income of $37,098 versus $25,421 for females. The per capita income for the city was $19,781. 14.0% of the population and 10.5% of families were below the poverty line. 19.6% of those under the age of 18 and 8.0% of those 65 and older were living below the poverty line. In the late 1950s, Rockford surpassed Peoria as the second largest city in Illinois by population, holding onto that position into the 21st century. In 2003, the status was changed as it was overtaken by Aurora after the results of a special census held by the latter city (as the two cities were not counted together, a direct comparison was not possible until the national census in 2010). Like many other Rust Belt and midwestern cities, Catholics make up Rockford's largest religious group. According to 2010 figures, 20% of Winnebago County residents are Catholic, 19% are Evangelical, 10% are Mainline Protestant and 48% belong to a non-listed faith or have no religion. The Roman Catholic Diocese of Rockford, several large evangelical and non-denominational churches, and several Lutheran and other Mainline Protestant congregations serve Rockford's Christian community. Rockford's Jewish community is served by a synagogue, the Muslim community by a mosque, the Sikhs by a temple, and its Buddhist community is served by two houses of worship. Since the creation of Winnebago County in 1836, Rockford has served as its county seat. Rockford is the largest Dillon's Rule municipality in Illinois, having revoked home rule in 1983. Along with a mayor (elected every four years), the Rockford City Council consists of 14 alderman (elected every 4 years), with the city divided into 14 wards. In contrast to other large cities in Illinois, Rockford is within a single township. By area and population, Rockford Township is the largest township in Illinois. Operating separately from the city of Rockford, the township performs civil services for several unincorporated areas of the city, as well as for other areas of the township outside of city limits. Mrs. Fisher's, also known as Mrs. Fishers Potato Chips, a regional manufacturer of potato chips founded in Rockford, is a recognized brand name of potato chips in parts of the Midwestern United States. Since 1923, Rockford has been home to Kegel Harley-Davidson; owned by the same family since 1912, it is the oldest family-owned Harley-Davidson franchise in existence. By highway, Rockford is linked by highway to Wisconsin (Madison, Milwaukee), Iowa (Dubuque), and many parts of Illinois. In the past 30 years, the centralized location of the region has worked to an advantage in attracting jobs the logistics and transportation industries. Public transportation in the city is provided by the Rockford Mass Transit District (RMTD). Known as the Northwest Tollway before 2007, the Jane Addams Memorial Tollway links the city to Madison, Wisconsin and the northwest Chicago suburbs. From Rockford north, I-90 replaces U.S. Route 51 in Illinois. I-90 also links the city with Milwaukee, Wisconsin, as I-43 joins it 2 miles north of the state line. Originally placed several miles east of the city, the Northwest Tollway would play a role in the rapid growth of the eastern half of Rockford in the later 20th century. U.S. Route 20 travels through Rockford twice. The city also marks the point where the highway and Interstate 90 no longer parallel each other travelling westward. The original highway is marked as a four to six-lane east-west business route (State Street) that divides the city to the north and south. From the 1970s to the late 1990s, the road played a key role in commercial development to the city. In 1965, a four-lane US 20 freeway bypass was completed. Starting from Northwest Tollway near Cherry Valley, the bypass traveled alongside the southern end of the city, joining the business route approximately two miles west of the city limits. From the west, US 20 (also known as the Grant Memorial Highway) provides a link to Freeport, Galena, and Dubuque, Iowa. Much of the highway west of Freeport is a winding two-lane road that discourages truck traffic. To the east, US 20 roughly parallels Interstate 90, becoming a major central thoroughfare in several Chicago suburbs. The US 20 bypass intersects with Illinois 251 (formerly US 51); it also forms the northern terminus of the Illinois segment of Interstate 39. Both highways are then concurrent eastward to Interstate 90, where the bypass ends. U.S. Route 51 travels through Rockford twice; the original alignment of the highway is now renamed Illinois Route 251. Entering through southeast Rockford through New Milford, Route 251 travels through the eastern half of the city among several major surface streets; as it exits Rockford, Route 251 serves as the primary north-south thoroughfare from Loves Park to South Beloit. During the late 1970s and early 1980s, the original Route 51 was replaced by the construction of Interstate 39, which adopted the alignment of the previous two-lane highway. Directly connecting Rockford to Bloomington-Normal, Interstate 39 also gives interstate access to Peoria and the Quad Cities; with access to Interstate 80 and Interstate 88, Interstate 39 allows for Rockford access to the southern suburbs of Chicago, also indirectly serving as a bypass around the city to Wisconsin. The Veterans Memorial Beltway consists of four-lane surface roads that create a continuous outer loop around the city. The roads that make up the beltway include Perryville Road, Harrison Avenue, Springfield Avenue, and Riverside Boulevard. The Rockford Mass Transit District (RMTD) provides fixed-route and paratransit service, with a service area including Rockford, Loves Park, and Machesney Park. The 40 fixed route buses operate over 17 routes Monday thru Saturday, 6 night routes and 5 routes on Sundays. In April 2018, Rockford became included in the LimeBike bicycle-sharing network. Using 500 commuter bicycles supplied by the company, residents rent bicycles through a mobile app, unlocking the dockless bicycles. Distinguished by their bright green color, LimeBikes are equipped with a basket, lights, and GPS (to locate them for rental); one-speed and three-speed units are in use. In 1946, after Camp Grant closed, the state of Illinois allowed for the establishment of an airport to serve Rockford. Built on the portion of the Camp Grant property between the Rock River and US 51 (now Illinois 251), the Greater Rockford Airport was between the southern border of Rockford and New Milford. Opened in 1946, the Greater Rockford Airport opened its current passenger terminal in 1987. In 1994, United Parcel Service (UPS) opened the first of its two facilities at the airport; Rockford is home to the second-largest UPS air package operation (after Worldport in Louisville, Kentucky). Following the loss of passenger service at the airport from 2001 to 2003, the Greater Rockford Airport underwent several name changes, becoming the Chicago Rockford International Airport in 2007. Since the restoration of passenger service in 2003, the Rockford airport primarily markets its passenger service for leisure travelers, offering flights by Allegiant Air along with charter operations on a seasonal basis. Machesney Airport, located north of the city, was opened in 1927 as a private airport serving the Rockford area. During World War II, the airport was utilized by the Army Air Corps. After the war, it again served as municipal airport, closing in 1974. After its closure, the Machesney Airport became the site of the Machesney Park Mall, built in 1980. As of 2017, the Rockford region is not served by passenger rail service. From 1974 to 1981, Rockford was served by Amtrak via its Black Hawk route, a daily train service from Dubuque, Iowa to Union Station in Chicago with a stop in Rockford. The Black Hawk was discontinued in September 1981 as part of funding cuts to Amtrak. During the 2000s, interest increased in relinking the Rockford and Chicago regions by rail. In 2006, the Northern Illinois Commuter Transportation Initiative proposed extending Metra train service from the western Chicago suburbs to Rockford. While Metra service has yet to be proposed on an official level, during the early 2010s, design work on a planned 2015 revival of the Black Hawk route on Canadian National rails., with Rockford as the initial terminus. As part of the ongoing Illinois financial crisis, state funding for the Black Hawk revival was suspended in February 2015, putting the project on hold. Rockford is served by several different freight railroad lines, the Union Pacific, the Canadian National, the Iowa, Chicago & Eastern (Canadian Pacific), and the Illinois Railway. The Union Pacific line from West Chicago terminates in Rockford, at a small yard. Canadian National line from Elgin enters from the South-East, and leaves in the North-West. They have a small yard, where they interchange with the Illinois Railway. The Illinois Railway Rockford Line comes from the South, joins the Canadian National line, where they continue on trackage rights to the Canadian National yard. Canadian Pacific (Iowa, Chicago, and Eastern) runs on Illinois Railway trackage rights from Davis Junction, and leaves on their own trackage to the North. All of the railroads interchange at a yard off of Main Street. The Union Pacific Railroad's Global III Intermodal Facility is approximately 25 miles (40 km) south of Rockford in Rochelle, Illinois, a community of 10,000. The complex is one of the world's largest intermodal facilities. Construction on the state-of-the-art facility was completed in 2003 in Rochelle due to the close proximity to four interstate highways (I-39, I-88, I-80, and I-90) and rail routes. 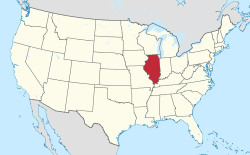 Although Rockford is in a large metropolitan area, the region does not have any public 4-year universities; the closest such institution is Northern Illinois University in DeKalb, 45 miles (72 km) away. Along with Rockford University (a private 4-year school of just under 2000 students), the city is the home to Rock Valley College (a 10,000-student community college), Rockford Business College (re-branded as Rockford Career College in 2009), and St. Anthony College of Nursing. In addition, it hosts several satellite branches of other schools, including Judson University (based in Elgin), Northern Illinois University (based in DeKalb), Rasmussen College, Embry–Riddle Aeronautical University as a part of their "worldwide campus", and the University of Illinois College of Medicine (based in Chicago). Rockford University is best known for graduating Jane Addams, recipient of the Nobel Peace Prize in 1931 for her efforts to promote international peace and justice. Laura Jane Addams (1860–1935) entered what was then Rockford Female Seminary in 1877 and became the first graduate to receive a B.A. degree from the newly accredited baccalaureate institution in 1882 (the school was renamed Rockford College in 1892, and Rockford University in 2013). Rock Valley College is a community college with several locations in the Rockford area. The main campus is the site of the Bengt Sjostrom Theatre. The former outdoor theatre now features a motorized retractable roof constructed during 2003. Serving Rockford, Cherry Valley, and portions of Winnebago and Boone counties, Rockford Public School District 205 covers an area of roughly 170 square miles (440 km2). With approximately 27,000 students, it is the state's fourth-largest school district by enrollment. District 205 has four high schools (Auburn, East, Guilford, and Jefferson), six middle schools, and 29 elementary schools. It also operates early-childhood and alternative education centers. In addition to its public school system, Rockford supports 27 sectarian and nonsectarian private schools ranging from elementary to secondary education. The Coronado Theatre marquee in its Art Deco styling over Main Street. 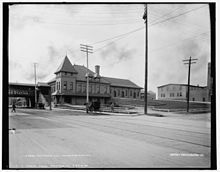 The attractions of Rockford are often of architectural significance. The Lake-Peterson House, constructed by alderman John Lake in 1873 and preserved by Swedish industrialist Pehr August Peterson, is a notable example of Gothic Revival. Added to the National Register of Historic Places in 1980, it is used for the School of Medical Technology of the Rockford-based Swedish American Hospital. Further Swedish influence on Rockford during the Victorian era is represented in the Erlander Home Museum, the base of the Swedish Historical Society. Swiss influence can be seen in the Tinker Swiss Cottage, which was opened as a museum under the park district in 1943 and was featured in an episode of Ghost Hunters in 2012. Modern architectural movements, like Art Deco and Prairie School, are also integral to Rockford. Most renowned is the Coronado Theatre, a civic and entertainment center named one of 150 Great Places in Illinois by the American Institute of Architects. The theatre is known for its blend of Art Deco with Spanish Baroque Revival and has hosted numerous performers over its lifetime, including the Marx Brothers, Frank Sinatra, and Bob Dylan. The 186-foot tall Faust Hotel complements the Coronado; constructed in 1929, it endures as Rockford's tallest building, albeit as apartments for the elderly and disabled. The Laurent House, a single-story Usonian home constructed in 1952 by Frank Lloyd Wright, is the only Wright building designed for a person with disabilities. Acquired by a private foundation from its commissioners, it was renovated into a museum in 2014. The Rockford Area has two additional places named by the American Institute of Architects in the 150 Great Places, Anderson Japanese Gardens in Rockford, Illinois and Poplar Grove United Methodist Church in Poplar Grove, Illinois. A tea house within Anderson Japanese Gardens. The area is often regarded as an outdoor destination. Rock Cut State Park is to the northeast of the city. Once home to various Scots, Canadians, and New Englanders, as well as a railroad line to Kenosha, the park's 3,092 acres are now utilized for camping, hiking, fishing and boating, and hunting. Anderson Japanese Gardens, modeled after the Portland Japanese Garden and landscaped by Hoichi Kurisu, is 10 acres in size and features a teahouse and guesthouse in the sukiya-zukuri style. John Anderson, the commissioner of the gardens, was presented with a commemorative silver cup by Japan for his efforts in the mutual understanding of cultures in 1992; he donated the gardens to a nonprofit organization later in 1998. Klehm Arboretum and Botanic Garden is 155 acres in size and is noted for its selection of both indigenous and foreign plant species. More recently, Experience Based Learning opened a Zip-line attraction, as its founder (Steve Gustafson) is a Rockford native. The park district of Rockford (Rockford Park District) is particularly active. It operates Aldeen Golf Course, which was rated the best municipal golf course in Illinois by Golf Digest and one of the top fifty golf courses in the nation that cost under $50 to play by Golf Magazine. In addition to Tinker Swiss Cottage, the park district maintains four other museums. The Burpee Museum of Natural History is home to the world's most complete juvenile Tyrannosaurus rex, Jane, as well as a triceratops, Homer. The Discovery Center Museum, a children's museum featuring over 250 hands-on exhibits including a planetarium, is on the 12 Best Children's Museums In The U.S. list by Forbes. The Burpee Museum and the Discovery Center Museum, along with the Rockford Art Museum and the bases for Northern Public Radio, the Rockford Dance Company, and the Rockford Symphony Orchestra compose the downtown Riverfront Museum Park complex. The last museum under the park district's authority is Midway Village and Museum Center, a recreation of a Victorian era village. The eastern riverwalk of Rockford is maintained by the park district, featuring the Nicholas Conservatory and Garden., Located on the bank of the Rock River, the conservatory is the third-largest in the state of Illinois. Just north of the gardens is Symbol, an Alexander Liberman sculpture moved from downtown during the 1980s and is now one of Rockford's most recognizable features. From 1943 to 1954, the Rockford Peaches were an inaugural team of the All-American Girls Professional Baseball League. Playing home games at Beyer Stadium, the Peaches won league championships in 1945, 1948, 1949, and 1950; the four championships are the most of any league member. The Rockford Peaches and the league itself were portrayed in the 1992 motion picture A League of Their Own. However, the characters in the film are fictional; the Peaches did not compete for the 1943 league championship (as depicted in the film). Since Beyer Stadium was demolished by the time of filming, the city of Rockford was not featured in production. Rockford is the 161st largest radio market in the United States. It is ranked 136th by Nielsen Media Research for the 2015-2016 television season with 170,140 television households. The area is served by over 15 commercial radio stations, over 5 non-commercial radio stations, 2 low power FM radio stations, 5 TV stations and 1 daily newspaper. ^ a b "Rockford (city), Illinois". State & County QuickFacts. U.S. Census Bureau. July 8, 2014. Retrieved September 15, 2014. ^ "Annual Estimates of the Resident Population for Incorporated Places of 50,000 or More, Ranked by July 1, 2013 Population: April 1, 2010 to July 1, 2013". U.S. Census Bureau, Population Division. May 2014. Retrieved September 16, 2014. ^ "U.S. Census Bureau QuickFacts: Rockford city, Illinois". Census Bureau QuickFacts. Retrieved November 1, 2018. ^ "Dictionary and Thesaurus - Merriam-Webster". Retrieved July 4, 2016. ^ "Rockford - Illinois, United States". Retrieved July 4, 2016. ^ Bridget, French. "All About Rockford, Illinois" (PDF). Rockford Area Convention & Visitors Bureau. Rockford Area Convention & Visitors Bureau. Archived from the original (PDF) on September 4, 2015. Retrieved June 27, 2014. ^ Krefft, Bryan. "Coronado Performing Arts Center". Cinema Treasures. Cinema Treasures. Retrieved June 27, 2014. ^ Warner, W. Lloyd (September 12, 1949). "A sociologist looks at an American community". Life Magazine. Life Magazine. pp. 108–119. ^ a b Kolkey, Jeff (December 11, 2008). "Goodbye, pedestrian mall: Downtown gets a 'cool, hip image'". Rockford Register Star. Rockford Register Star. Retrieved June 26, 2014. ^ Schwitters, Kevin. "Historical Facts About Symbol". Symbol—The Official Rockford Sculpture. Kevin Schwitters. Retrieved June 27, 2014. ^ Hilkevitch, Jon (April 10, 2014). "Amtrak rail service between Chicago and Rockford to begin in 2015". Chicago Tribune. Chicago Tribune. Retrieved June 26, 2014. ^ a b "About Coronado Performing Arts Center". Coronado Performing Arts Center. Coronado PAC. Retrieved June 27, 2014. ^ Gary, Alex (August 23, 2012). "Woodward picks Loves Park for $200M expansion". Rockford Register Star. Rockford Register Star. Retrieved June 28, 2014. ^ Karp, Gregory (January 9, 2014). "Illinois had shot to land 777X plant". Chicago Tribune. Chicago Tribune. Retrieved June 28, 2014. ^ Westphal, Melissa (October 9, 2013). "New SwedishAmerican cancer center opens next week in Rockford". Rockford Register Star. Rockford Register Star. Retrieved June 28, 2014. ^ Wiser, Mike (July 11, 2008). "MetroCentre revamp project winding down, revenue going up". Rockford Register Star. Rockford Register Star. Retrieved June 26, 2014. ^ Kolkey, Jeff (August 11, 2011). "Rockford MetroCentre has new name: BMO Harris Bank Center". Rockford Register Star. Rockford Register Star. Retrieved June 26, 2014. ^ Curry, Corina (July 20, 2012). "Rockford's new riverwalk opens". Rockford Register Star. Rockford Register Star. Retrieved June 26, 2014. ^ Curry, Corina (October 29, 2011). "Rockford's new federal courthouse dedicated". Rockford Register Star. Rockford Register Star. Retrieved June 27, 2014. ^ Kolkey, Jeff (October 9, 2009). "Keith Creek home demolition to start soon". Rockford Register Star. Rockford Register Star. Retrieved June 28, 2014. ^ Green, Chris (December 13, 2013). "An empowered Rockford neighborhood celebrates accomplishments". Rockford Register Star. Rockford Register Star. Retrieved June 28, 2014. ^ Dougherty, Conor (September 8, 2013). "Welcome to Rockford, Ill, the Underwater Mortgage Capital of America". The Wall Street Journal. The Wall Street Journal. Retrieved June 26, 2013. ^ "Economy at a Glance". Bureau of Labor Statistics. Bureau of Labor Statistics. June 20, 2014. Retrieved June 26, 2014. ^ Curry, Corina (February 24, 2009). "People Who Care: It all began 20 years ago". Rockford Register Star. Rockford Register Star. Retrieved June 27, 2014. ^ Kolkey, Jeff (June 21, 2018). "Unemployment falls across Rockford region". Rockford Register Star. Rockford Register Star. Retrieved August 15, 2018. ^ "Janesville, Wisconsin". Wikipedia. September 12, 2018. Retrieved August 15, 2018. ^ Leaf, Brian (March 2, 2016). "Negotiations continue as city tries to keep MercyRockford from moving $485M project to Wisconsin". Rockford Register Star. Rockford Register Star. Retrieved August 15, 2018. ^ "Mercyhealth breaks ground on $485 million women's and children's hospital in Rockford". Mercy Health. June 6, 2016. Retrieved August 15, 2018. ^ Green, Chris (September 28, 2017). "Construction on pace for new Mercyhealth hospital". Rockford Register Star. Rockford Register Star. Retrieved August 15, 2018. ^ Braun, Georgette (September 9, 2016). "Boxes with Amazon's logo leave on plane today, marking watershed moment for Rockford airport". Rockford Register Star. Rockford Register Star. Retrieved August 15, 2018. ^ Guerrero, Isaac (July 24, 2018). "Rockford airport moves up to nation's 22nd busiest cargo airport". Rockford Register Star. Rockford Register Star. Retrieved August 15, 2018. ^ "July Daily Averages for Rockford, IL". The Weather Channel. February 27, 2012. ^ "Historic Record Cold Temperatures Across Northern Illinois". The Weather Channel. February 27, 2012. ^ "NowData - NOAA Online Weather Data". National Oceanic and Atmospheric Administration. Retrieved June 27, 2016. ^ "Station Name: IL ROCKFORD GTR ROCKFORD AP". National Climatic Data Center. Retrieved June 27, 2016. ^ "Census of Population and Housing". U.S. Census Bureau. Archived from the original on May 12, 2015. Retrieved September 15, 2014. ^ "Race, Hispanic or Latino, Age, and Housing Occupancy: 2010". U.S. Census Bureau. Archived from the original on May 20, 2011. Retrieved October 1, 2011. ^ "The Association of Religious Data Archives". www.thearda.com. Retrieved June 29, 2014. ^ "Community Directory". Jewish Federation of Greater Rockford. Archived from the original on November 13, 2014. Retrieved June 29, 2014. ^ Vela, Susan. "Rock River Valley's Laotians Celebrate New Year". RRstar.com. Rockford Register Star. Retrieved June 29, 2014. ^ "Wards and Aldermen". The City of Rockford. Archived from the original on April 11, 2016. Retrieved April 12, 2016. FOR THE FISCAL YEAR ENDED DECEMBER 31, 2016" (PDF). City of Rockford (IL) Finance Office. 2017. p. F24 (230). Retrieved July 3, 2018. ^ "Kegel Harley-Davidson; Worlds Oldest Dealer". ^ "Rockford Mass Transit District". www.rmtd.org. ^ Cormier, Gregory (April 7, 2018). "500 LimeBikes to hit stateline streets Saturday morning". MYSTATELINE. Retrieved September 11, 2018. ^ a b Guerrero, Isaac. "LimeBike rolls into Rockford on Saturday". Rockford Register Star. Retrieved September 11, 2018. ^ "Amtrak Black Hawk". Retrieved July 16, 2012. ^ Press, Associated. "Plan for Amtrak service from Chicago to Rockford on hold". chicagotribune.com. Retrieved July 17, 2017. ^ "Rasmussen College - Regionally Accredited College Online and on Campus". Retrieved July 4, 2016. ^ "Embry-Riddle Worldwide". Worldwide.erau.edu. Retrieved July 11, 2013. ^ Blatcher Martin, Charlyne. "Rock River Valley Insider: Starlight Theatre's retractable roof is a gem". rrstar.com. Retrieved March 7, 2015. ^ "Lake-Peterson House". Waymarking. Groundspeak, Inc. Retrieved June 27, 2014. ^ "Erlander Museum". Swedish Historical Society of Rockford, IL. Swedish Historical Society of Rockford, IL. Archived from the original on June 14, 2014. Retrieved June 27, 2014. ^ Curry, Corina (October 10, 2012). "'Ghost Hunters' episode filmed in Rockford at Tinker Swiss Cottage". Rockford Register Star. Rockford Register Star. Retrieved June 27, 2014. ^ "Coronado Theatre". American Institute of Architects. American Institute of Architects. Retrieved June 27, 2014. 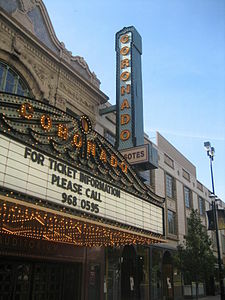 ^ "Coronado Theatre, Rockford, IL". Lares Associates. Lares Associates. Archived from the original on October 16, 2015. Retrieved June 27, 2014. ^ Massie, Caroline (May 9, 2014). "A Grand Opening for a "Little Gem"". Architect Magazine. Architect Magazine. Retrieved June 27, 2014. ^ "Rock Cut State Park". Illinois Department of Natural Resources. Illinois Department of Natural Resources. Archived from the original on June 27, 2014. Retrieved June 27, 2014. ^ Manzullo, Don (2000). "Anderson's Japanese Gardens". Local Legacies. Library of Congress. Retrieved June 27, 2014. ^ "Mission and History". Klehm Arboretum and Botanic Garden. Klehm Arboretum and Botanic Garden. Retrieved June 27, 2014. ^ Haas, Kevin (October 28, 2011). "Nicholas Conservatory to make public debut". Rockford Register Star. Rockford Register Star. Retrieved June 27, 2014. ^ "About Aldeen Golf Club". Aldeen Golf Club. Rockford Public Schools. Archived from the original on September 4, 2015. Retrieved June 27, 2014. ^ Olmsted, Larry (January 30, 2012). "12 Best Children's Museums In The U.S." Forbes. Forbes Magazine. Retrieved June 27, 2014. ^ "Nicholas Conservatory & Gardens". Rockford Park District. Rockford Park District. Retrieved June 27, 2014. ^ "Rockford Rage home page". Rockford Rage. 2010. Archived from the original on April 26, 2010. Retrieved February 22, 2010. ^ a b c d e f "Interactive Directory: Rockford, Illinois". Sister Cities International. Archived from the original on June 30, 2014. Retrieved December 18, 2013. ^ "Radio Market Survey Population, Rankings & Information" (PDF). Nielsen. Spring 2016. Retrieved April 28, 2016. ^ "Nielsen Local Television Market Universe Estimates" (PDF). Nielsen. Spring 2016. Archived from the original (PDF) on April 12, 2016. Retrieved April 28, 2016. Sutrina, Katie. "The 'Rosies' of Rockford: Working Women in Two Rockford Companies in the Depression and World War II Eras," Journal of the Illinois State Historical Society, 102 (Fall–Winter 2009), 402–28. 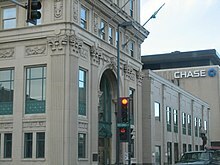 Wikimedia Commons has media related to Rockford, Illinois. Wikivoyage has a travel guide for Rockford. Wikisource has the text of The New Student's Reference Work article "Rockford, Ill.".